It's finally Friday and everyone's favourite Mexican dish is on the menu. 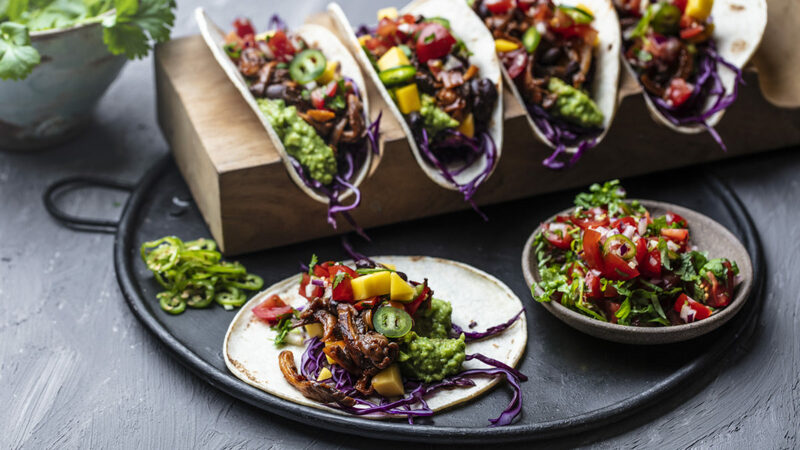 This plantbased veggie tacos with tomato salsa and guac is the perfect start to the weekend! This is the 5th recipe in EAT’s one week dinner menu. It is made by Norwegian chef Lise Finckenhagen and aligns with EAT-Lancet’s Planetary Health Diet. To find the dinner recipes for the other days of the week click here. Tear or cut the mushrooms into pieces/slices. Peel and finely chop the onion and garlic. Fry the onion over a medium heat for about 8 minutes until it’s soft and golden, stirring at regular intervals. Add the garlic, cumin, coriander and paprika and leave to fry while stirring for about two minutes. Empty the onion mixture out onto a plate and set aside for now. Pour a little extra oil in the pan and fry the (mushrooms?) over a high heat until it is golden and fried. Reduce the temperature, pour the onion mixture back into the pan together with some chili sauce, tomato purée, soy sauce, water and honey. Bring to the boil while stirring and leave to boil until most of the liquid has evaporated. Stir regularly to prevent it sticking to the bottom. Finally, stir in the beans and add a little pepper to taste. To make the salsa, chop the tomatoes into small pieces. Peel and finely chop the onion and garlic, and thinly slice the chili. Mix the tomatoes, chili, onion, garlic and lime juice together. Season with salt and a pinch of sugar. Add the chopped coriander at the end. To make the guacamole Halve the avocados, remove the stones and scrape the flesh into a small bowl. Use a fork to mash the flesh and mix in lime juice, finely-chopped garlic and chili. Add salt and pepper to taste. Heat the tortillas and fill with the mushroom mixture, tomato salsa, guacamole, red cabbage and mango. Top with a little extra chili and add a few drops of lime juice, if necessary.